To be successful in any business, an entrepreneur needs to use the available resources at his disposal while limiting the borrowing of funds. Having 100% ownership of the business and not giving up an equity stake to an investor is on the wish list of every entrepreneur. This may be accomplished with what is called bootstrapping. Once one becomes a bootstrapper, no one will ever be on your back all the time, asking what has been done or directing on how you should run your business. Bootstrapping comes with a wide range of benefits to entrepreneurs. To begin with, the business won't be indebted to any investor. Secondly, you won't be under any pressure to repay any form of business loans to a financial institution. Many people who have fantastic business ideas have a borrowing mentality such that they believe one needs to have thousands of dollars as start-up capital which is an absolute misconception. Bootstrapping means using the little that you have as start-up capital for the business. When little profits are realized, you need to plough them back into the business. By doing so, the business would experience growth. The million dollar question with many entrepreneurs is "how can I learn the art of bootstrapping my business?" We got you covered. Here is a vivid description of 25 business bootstrapping ideas you need to know. Starting up a world-class restaurant sounds like an awesome idea right? Many of us would obviously love to own one. However, such an investment needs a huge amount of capital injection. Thus, it is good to put it as a long term objective. If you have less capital, it is advisable to start up with a food truck and accumulate enough profits to start your restaurant. Since you do not have a large amount of capital to start up a large business, we would recommend that you use the little capital that you have and invest in a business that is market ready. Look for a business that generates immediate returns so you can put the profits back into the business. Doing so will allow you to accumulate the business funding you need to kickstart the large business. One of the largest mistakes you can ever make as an entrepreneur is to quit your job believing that your business will be an immediate success overnight. To avoid disappointment, start your business idea as a part-time business and analyze the progress and later on dive into it. When starting up a business, it is wise to conserve your start-up capital as much as possible. This means that you can swap the products that you need with the products someone else needs. With this kind of exchange, though, make sure that the products you exchange are of equal value. If you are planning to successfully bootstrap your business, one of the best methods is to cut down your daily expenses. For example, you may start your business from home to avoid monthly rental payments. Can you go for some days without going out to lunch? If you can consider doing so among many other steps you can take to keep your expenses low. As explained in #3 above, it is good to start your business as a part-time thing. With this, you may look out for a partner with different skills that you don't have and partner up with them. Also, the partner should be available whenever you are held in your job. This is the best way to run a small business without high expenses and added stress. Many entrepreneurs find it hard to sustain their businesses at the start especially when the returns are lower than expected. Due to this, it's good to protect whatever you have by limiting your personal liability. Consider incorporating your business online so if you are sued by a client, your personal assets are protected. As an entrepreneur, conducting market research and getting to know all the dynamics that your business venture will be involved in limits the chance of failure. On the same note, you will never need an infusion of capital from someone else by being well prepared. There are great tools such as Survey Monkey that can help you in doing online customer surveys. To avoid borrowing of funds and resorting to personal and/or business credit cards, the best way to bootstrap your business is to collect all the savings you have and use them as your startup capital. This makes it easy for you to depend on yourself in running all the costs involved in your business. However, be careful not to dip into your retirement savings as you may never pay it back. A business plan acts as a guideline for all that your business needs to achieve. Thus, a well-done business plan will always ensure that you do not waste your capital via impulse buying or unnecessary expenses that might lead to a cash decline in your enterprise. Monthly office rent payments are one of the most tedious expenses you can subject yourself to when starting your business. If you can comfortably work from home and provide all the services that your clients need, then you will be able to save a lot of cash. Don't just save though, save and invest back into your business for expansion. As an entrepreneur who is starting up a business, it is not advisable to look for an office space unless you have seen that the market demand for your products is high. This is because an office needs new equipment, office furniture and perhaps one extra member on staff which are all added expenses. If you can operate without an office then do so. Another great idea to bootstrap your business is to ensure that all your clients pay for their product purchases instantly instead of financing their purchase. This will make it easier for you to make other purchases sooner than later and keep investing money back into the business. Time is money and hence the earlier the payments, the better. 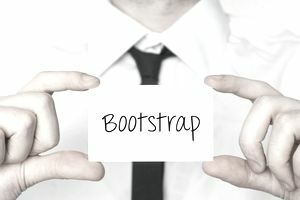 The main purpose to bootstrap your business is to ensure that only your capital runs the business without the need for capital infusion from any other source. Therefore, any entrepreneur who is serious about their business should keep off engaging in unnecessary expenses. Go for free version software available online for all your needs. A business that is financially stable will always grow and expand. This should mark the foundation for you. Keep a very close eye on any cash that either flows in or out of the business. Do it on a daily basis. Look for an accounting program that can sync your bank account online for you to always have the real-time financial status of your business. One of the major causes of business failure is bad debts. There is a tendency for entrepreneurs to always forget to follow up on all the invoices and receivables of the business. You should, therefore, download one of the free invoicing apps for your business which will make it easy for you to send reminder messages and follow up on debts that are past due. We understand that at one time or the other, you will definitely need someone to maybe develop a website for your business. However, you do not need to employ someone permanently to do this. The best way is to outsource employees and pay them either on an hourly or a daily basis instead of employing them permanently and give them monthly salaries. When it comes to maybe moving your furniture, avoid hiring somebody to do it for you expecting payment. Be as economical as possible to increase your savings. Try reaching out to some of your family members for help and see if they will do you a favor instead of hiring someone whom at the end of the day would demand payment. Traditional advertisement methods such as radio and TV stations are almost outdated. Social media is the new thing in town with unmatched ability to gather fans and followers. Make sure that your business has an online presence and promote all your products from there at no to little cost. To any business, image is everything. Thus, you must ensure that your website, as well as social media accounts, have top quality photos and graphics that are appealing to the eye of a potential customer. Download top quality images for your business from pixabay or Stocksnap with ease and upload them. Do not be tempted to spend the profits gained by your investment. Many entrepreneurs tend to take the profits from the business in buying fancy office furniture or cars to impress customers. Resist all these and invest your finances in new technologies that will boost your business. In order to properly bootstrap your business, you need to keep off from impulse buying. Always have a budget for your needs and make sure that you stick to it by avoiding to buy stuff that is not on your budget. If you want to fully ensure that your business is fully bootstrapped, one rule has to be adhered to. The rule is to ensure that cash inflow is higher than cash outflow. One of the best ways to reduce cash flow is paying your suppliers at a later date after you have already sold the products. When using this tip, however, always ensure that you pay off the debts after the products are sold to avoid debt accumulation. There comes a time when your business could be in need of certain machinery. Since these machines could be used once in a while in your business, it is better to lease them from another company since it is cheaper than buying. Starting small does not mean that you should just lay the foundation lightly. Have a strategic plan for the business. Go ahead and open a separate business account for the business and work hard to establish a high credit score. Also, set a room for expansion among many other issues that might benefit the business in the future.